I waited until my day was nearly over and looked back at these (19th July 2013). I am going to start doing daily draws as often as possible so I can make sense of the meanings of the cards for me personally. The WHIP/broom was about an argument between me and my husband (Whip) and the clearing up of it (broom). We also had little misunderstandings as the heat of the day got to us but we always got over them quickly. 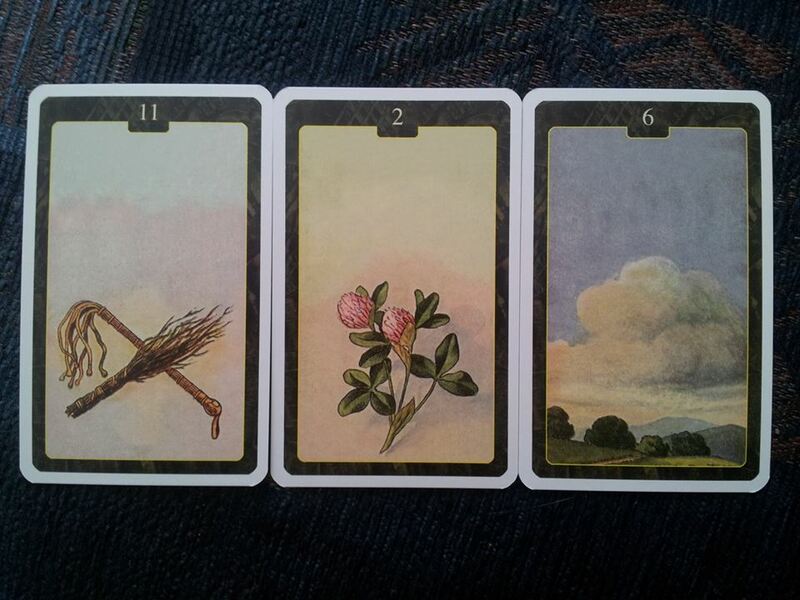 Ah getting over them quickly – now the CLOVER card is a short time card – making perfect sense now. The CLOVER card, which is little luck or happy news/ a surprise, could have been either asking for a sign from my granddad (he passed away in January of this year and he has sent us 2 signs in 2 days now and I have just realised the clover is the number 2 card haha) – whether to stay in St Albans or go home as it was so hot. I said “Granddad please show us a sign if its time to go home or stay – to show us a shop me and Dan would both like.” This would mean for us to stay – as it happened we found no such shop but did look in the tourist info shop and saw what used to be a court room in there. We sat in there for a bit then went to find our bus stop, we sat down and wondered on a few things then the bus came straight away – brilliant timing. Or it could have been that when we went to the cinema that night I had a nice surprise that my best mate from my old ward also came to see the same film at the same time with her mum. The CLOUDS – the light side faced me and meant a good ending but also means clarity – now the dark side means confusions, complications and danger – this was facing away from me so in light of what I now know, I know it meant danger, complications for another poor soul – and confusion for the public. . . There are a few tall buildings in my home town centre that are infamous for people committing suicide from and that night there was a man sitting on the edge of one of these with the roads blocked off by the police and the public standing there gawping at the poor man. I don’t agree with suicide but do believe he must be in such a bad state and was crying out for help – I don’t believe he was serious in completely ending it otherwise he would not have hesitated. After the cinema the roads were unblocked but there was a yellow helicopter in the square so don’t quite know what happened. But still disturbed at the sheer amount of people who stood and gawped, some with their phones out. I found out today that the man died. He must not have died straight away.